The granita I made comes from a recipe from the magazine “La Cucina” of the Corriere della Sera. Since December last year (2012) I have not found on it on newsstands and for that I am very sorry. The magazine had very nice graphic layout with original recipes that were simple at the same time. This granita allows us to offer a fresh dessert to help digest at the end of a meal with guests. I recommend you try before the end of the summer. Wash the basil leaves and deprive them of the hard stems. Boil water with the sugar. Turn off the heat and stir to melt completely. Add the basil leaves and lemon juice. Stir and allow to melt an hour. Filter the liquid and pour into a steel container. When cold, place it in the freezer and after 30 minutes, stir with a fork. Repeat this operation several times at a distance of 30 minutes. In this way they break the ice crystals and the preparation will be softer. After 3 hours the granita should be ready. Meanwhile, prepare the strawberry sauce. Wash, remove stems, cut them into pieces, season with sugar and lemon. Allow to marinate for at least 30 minutes. Blend all the ingredients to obtain a thick sauce. 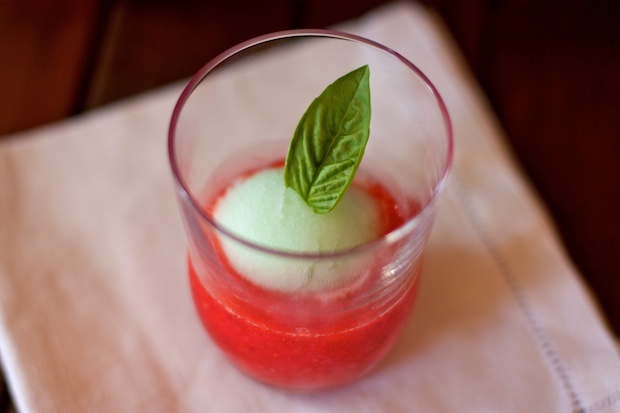 Place in individual glasses with a foundation of strawberry sauce and above the granita. Serve immediately.